We are dedicated to helping students and families navigate the financial commitment of a VFMC education. We are proud to say that each year, we award more than $5 million in scholarships and financial aid. See what scholarship and award opportunities are waiting for you! Academic Scholarships: $2,000-$15,000 per year are offered to students with excellent academic records. Renewable each academic year with a 2.0 GPA. Students who are interested in participating in the VFMAC Regimental Band may be eligible for the Valley Forge Band Scholarship. Students must have a cumulative high school GPA of 2.5, SAT 1000 (Math and Verbal) or ACT 17, a recommendation from their high school band director, and successfully complete an audition for the Valley Forge Regimental Band Director. Qualified students will be eligible for a Valley Forge Band Scholarship between $12,000 and $15,000. Renewable each academic year with a 2.0 GPA. Combined awards cannot exceed $18,000 per academic year. Awarded to assist female cadets who have demonstrated leadership, academic excellence and a commitment to improving their community. Students must have a cumulative high school GPA of 2.5, SAT 1000 (Math and Verbal) or ACT 17. Two letters of recommendation are required. If qualified, students will be eligible for a Valley Forge grant of up to $12,000. Renewable each academic year with a 2.0 GPA. Combined awards cannot exceed $18,000 per academic year. Students who are interested in participating in Army ROTC but do not receive a U.S. Army ROTC Scholarship, may be eligible for the Valley Forge ROTC Grant. Students must have a cumulative high school GPA of 2.5, SAT 1000 (Math and Verbal) or ACT 17. Students will be eligible for a Valley Forge grant of up to $12,000. Renewable each academic year with a 2.0 GPA. Combined awards cannot exceed $15,000 per academic year. Awarded to students or dependents of U.S. military veterans, police officers, paramedics, and firefighters. Other “service related” positions may be considered. Students must have a cumulative high school GPA of 2.5, SAT 1000 (Math and Verbal) or ACT 17. Students must provide verifiable proof of qualifications. If qualified, students will be eligible for a Valley Forge grant of up to $12,000. Renewable each academic year with a 2.0 GPA. Combined awards cannot exceed $15,000 per academic year. 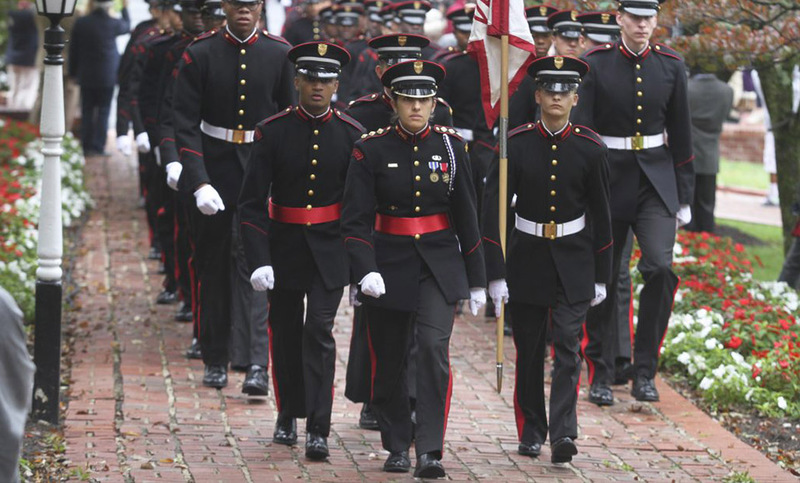 Valley Forge Military College has many donors who have established endowed scholarship funds to support both new and returning cadets. Each award has specific eligibility requirements and criteria to be selected. There is considerable competition for these scholarships. Not all applicants will receive an endowed award. Awards are applied to the following fall semester and may take the place of need-based grants. Students must earn a high school diploma or GED; live in the commonwealth during the term of the appointment; have a cumulative high school GPA of 2.5, SAT 1000 (Math and Verbal) or ACT 17. Appointed students will be eligible for a Valley Forge grant of $12,000. Renewable each academic year with a 2.0 GPA. Combined awards cannot exceed $18,000 per academic year. Interested students must apply through the VF ROTC office. Scholarship is full tuition and some fees. Cumulative 2.5 GPA, Combined SAT math and reading score 920 or 19 on the ACT. Pass the DOD medical exam, be a U.S. citizen of good moral character at least 17 of age years of age. VFMC will provide a scholarship for room and board. No other VFMC scholarships will apply. Awarded to assist INTERNATIONAL female cadets who have demonstrated leadership, academic excellence and a commitment to improving their community. Students must have a cumulative high school GPA of 2.5, SAT 1000 (Math and Verbal) or ACT 17. Two letters of recommendation are required. A TOEFL score of 75 or IELTS score of 6 required. If qualified, students will be eligible for a Valley Forge grant of up to $5,000. Renewable each academic year with a 2.5 GPA..
$2,000-$8,000 per year grants are offered to qualified INTERNATIONAL students with excellent academic or athletic records. A TOEFL score of 75 or IELTS score of 6 required. Renewable each academic year with a 2.5 GPA.